In light of our sponsorship to the Chinese New Year reception, each Company member of FCCC is entitled to receive 1 free enrolment in Cathay Pacific Airways frequent flyer program “The Marco Polo Club” and start with a higher status (Silver) offering several benefits and savings making travel on Cathay Pacific Airways even more convenient. Further details can be received during the Chinese New Year reception, so please come and meet us there. 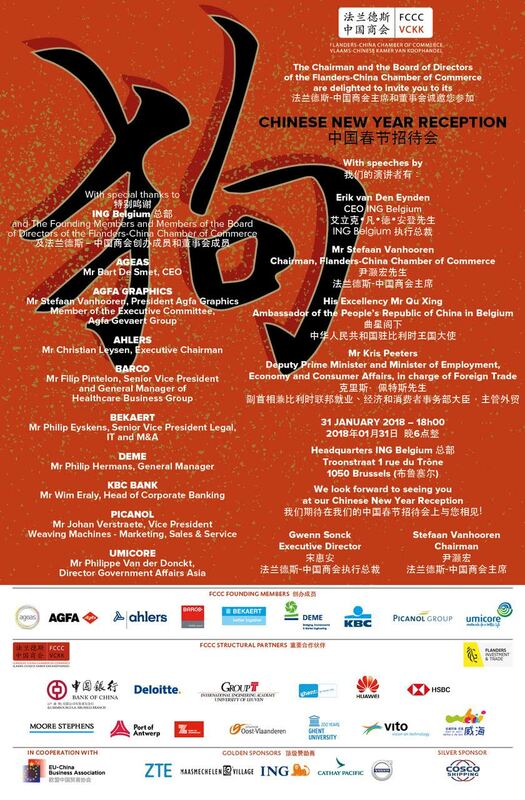 On 31 January 2018, the Flanders-China Chamber of Commerce will celebrate Chinese New Year at Headquarters ING Belgium, Troonstraat 1 rue du Trône, 1050 Brussels! Speeches will be followed by a networking reception. We hope you can join us to celebrate the Year of the Dog with us! The Flanders-China Chamber of Commerce wishes you a Happy New Year! The EU has confirmed its openness to foreign investments. However, it has also recognised the need to defend its essential interests. For this reason, a new European framework for the screening of foreign investments into the European Union was proposed by the European Commission in September 2017. At the same time, the Chinese Government is reducing foreign investment restrictions in line with President Xi Jinping’s vision. Companies internationally active need to be aware of these developments. But, are these rules all that they appear? You are cordially invited to our event, during which we will examine recent evolutions in the European and Chinese regulatory frameworks. Linklaters is honoured to organise this event jointly with the Flanders-China Chamber of Commerce (FCCC). Please advise us if you require any special assistance at this event. EU is the largest trading partner of China and China is the second largest trading partner of the EU. China is also a dominant trading partner of many other countries.Next to being the biggest factory in the world, China’s economy, when measured by purchasing power parity, surpassed that of the United States to become the world’s largest. China’s global economic power cannot be denied anymore. Many Belgian entrepreneurs have successfully set up businesses in China. During our panel discussion “Doing Business in China”, Simon Barker, Geert Roelens and Patrick Keereman want to share with you recent China business trends and opportunities, but also some of the pitfalls and challenges they have faced while trying to achieve their endeavours. This forum, which is focusing on mid-sized companies with an ambition to do business in China, will allow you to raise any question you may have. Registration is now open for the 2015 edition of the Afstudeerbeurs / Job Market for Young Researchers (31 March 2015). Click http://afstudeerbeurs.augent.be/ or go directly to the registration page. After last year’s roaring success of the China Job Corner, we are now organizing an Asia Job Corner on the 2nd floor of the ICC. Occupying a booth, you will have direct access to Asian (Chinese, Indian, …) final-year Master students, doctoral students and postdoctoral fellows in all academic disciplines. The purpose of the Job Corner is to help Asian job seekers find a (first) job and make it easier for Belgian employers to network with these young professionals and introduce them to their businesses in Asia. Interested in participating in the Asia Job Corner? Please indicate ‘Asia Job Corner’ in the comments section of the registration form. Should you have any further questions about the Asia Job Corner, please contact Katrien Daemen-de Gelder (katrien.degelder@UGent.be ).